This Atco GT 30H is an extremely popular lawn tractor which is small enough to go through a 36’’ gate yet large enough to maintain a good sized lawn. A reliable Briggs & Stratton 344cc engine deliver power to a fully hydrostatic transmission on the GT 30H. Hydrostatic transmissions are clutch-less automatic systems that allow infinitely variable speed adjustment; they shuttle seamlessly from forward to reverse which greatly enhances manoeuvrability. The cutting deck features twin contra rotating blades for a fine finish plus powerful rear discharge and collection of clippings. Blades are engaged or disengaged at the flick of a switch through an electronic clutch. Cutting height is adjustable from 25mm to 80mm. A snap on hose connection on the cutter deck facilitates cleaning after use. Clippings are collected in a rear mounted 240 litre collector which features a buzzer to let the driver know when it needs emptying. Tipping the collector is done from the driver’s seat. Cutting Width	84cm / 33"
Wheels	Front 15" Rear 18"
No key features selected for the ATCO GT30H RIDE ON 30" LAWNMOWER. 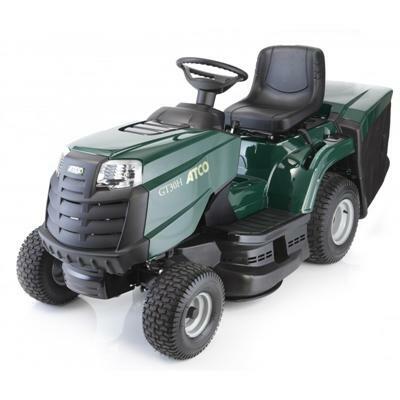 No quantity discount for the ATCO GT30H RIDE ON 30" LAWNMOWER. Be the first to submit a review for the ATCO GT30H RIDE ON 30" LAWNMOWER.